(no tour on: 25-26 Dec, 31 Dec, 01 Jan). Our Prague City & Castle Bike Tour is an easy to medium-paced cycle ride, covering both the centre of Prague and the high ground overlooking the city near Prague Castle. Join us to discover the sights and attractions in the way only a bike makes possible, and enjoy stunning views over this beautiful city. Our bike tours are led by experienced guides, who will show you Prague in a fun and light-hearted, yet informative manner. There are several rest breaks en-route, to catch our breath and to allow the guide to explain some of the history and legends associated with the places we visit. Young and old, new bike riders to advanced cyclists, will all cope with and enjoy this trip. And after just 2½ hours, you will feel like you have discovered the best of Prague. The tour begins in the Old Town, from where we cycle through the cobbled back streets, cross the Vltava River, and ride up to the heights of Letna Park. The whole of this side of Prague is elevated, and while there is some road cycling, much of the trip is through parkland. This ensures enjoyable biking all the way through to Petrin Park. En-route we stop off at Prague Castle and other points, such as the Metronome (where the largest statue of Stalin once stood), to marvel at the views, and to take advantage of excellent photo opportunities. We then descend back into the city centre, cycling through the park on Kampa Island, over the river once more, and through the New Town to reach Wenceslas Square. Finally, we head back through the Old Town, where the tour ends. Our Prague bike tours offer visitors a unique historical experience, in a fun and entertaining manner. As we ride thorough the streets, the famous squares, the parks, and across the river, immerse yourself in the stunning architecture all around. We use good quality, comfy bicycles, equipped with 24 gears and suspension. Prague Experience bike tours are in English. Tours can be arranged in other languages for groups (10+ people). The price includes bicycle hire, bike insurance and all equipment, including rain ponchos and warm gloves if required (the tour still runs in bad weather). Note: Participants must be able to ride a bicycle, but it is fine if you are unfit or have not ridden in a long time. Participants undertake this activity at their own risk. 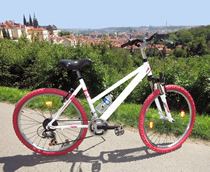 Note: We also offer a bike tour with no hills, which covers the city centre only: Prague City Bike Tour. -a departure time of your choice between 08:00-10:00 or 15:00-18:00. -a departure day of your choice all year round. Guided bike tour of Prague + Rental of bicycle, helmet, basket and bungee cord + Rain poncho + Gloves (in winter) + Bike insurance + Map of Prague + Bag storage.